Thessaloniki (Greek: Θεσσαλονίκη, IPA: [θesaloˈnici]), Thessalonica, or Salonica is the seicont-lairgest ceety in Greece an the caipital o the periphery o Central Macedonie. Its honorific title is Συμпρωτεύουσα (Symprotévousa), literally "co-caipital", a reference tae its historical status as the Συμβασιλεύουσα (Symvasilévousa) or "co-reignin" ceety o the Byzantine Empire, alangside Constantinople. Accordin tae the 2011 census the municipality o Thessaloniki haes a population o 322,240, while the Thessaloniki Urban Aurie (the contiguous built up aurie formin the "Ceety o Thessaloniki") haes a population o 790,824; makkin it the fift lairgest an maist populatit ceety in the Balkans an the seicont maist populatit ceety that is no a caipital. Furthermair, the Thessaloniki Metropolitan Aurie extends ower an aurie o 1,455.62 km2 (562.02 sq mi) an its population in 2011 reached a total o 1,006,730 inhabitants. 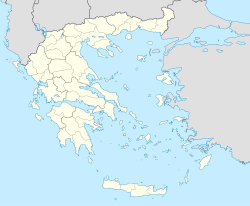 Thessaloniki is Greece's seicont major economic, industrial, commercial an poleetical centre, an a major transportation hub for the rest o sootheastren Europe; its commercial port is an aa o great importance for Greece an its sootheast European hinterland. The ceety hosts an annual International Trade Fair, the Internaitional Thessaloniki Film Festival, an the lairgest bi-annual meetin o the Greek diaspora. Thessaloniki is hame tae numerous notable Byzantine monuments, includin the Paleochristian an Byzantine monuments o Thessalonika, a UNESCO Warld Heritage Steid, as well as several Ottoman an Sephardic Jewish structurs. ↑ 1.0 1.1 1.2 1.3 1.4 "'Πίνακας 1: Προσωρινά αποτελέσματα του Μόνιμου Πληθυσμού της Ελλάδος'" (PDF). National Statistical Service of Greece: Ανακοίνωση προσωρινών αποτελεσμάτων Απογραφής Πληθυσμού 2011, 22 Ιουλίου 2011. Archived frae the oreeginal (PDF) on 2012-09-18. ↑ "Gross domestic product (GDP) at current market prices at NUTS level 3". Eurostat. 2010. Retrieved 2 December 2011. ↑ AIGES oHG, www.aiges.net. "SAE - Conventions". En.sae.gr. Retrieved 2009-01-05. Wikimedia Commons haes media relatit tae Thessaloniki.